Opening image. Philip strangles David with a rope while Brandon holds David. Brandon checks for David’s heartbeat to make sure he’s dead. Shocked Philip watches. Brandon commands Philip to open the trunk. They place David’s body inside. Brandon and Philip close the trunk. They both breath heavily for a few moments. Brandon lights a cigarette and blows a cloud of smoke. Brandon walks over to the window, insists on opening the curtains. Brandon stands with joy, watching out the window, commenting on the lovely evening. Brandon walks back to Philip. He admits that he wishes they would’ve been able to do it in the sunlight. Brandon takes Philip’s gloves off for him. Philip stares at the trunk uneasy. Philip checks the lock on the trunk. He goes into a frenzy about the dangerous nature of their situation. Philip admits that Brandon scares him, but it’s all a part of Brandon’s charm, or appeal. Rope is a 1948 film by Alfred Hitchcock that is loaded with innuendo, masked within the illusion of a single continuous take. Strong implications throughout the duration of Rope convey that there is more going on between the main characters, Brandon and Philip, than the sole conspiracy of murdering their former classmate, David. 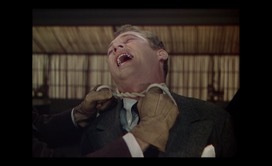 Because of the near invisibility of editing, as well as focus on the mise-en-scene and camera framing within Rope, Hitchcock is able to suggest the homosexual nature of Brandon and Philip’s relationship without explicitly depicting it on-screen to the audience. 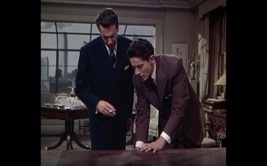 Specifically, within the opening sequence, Hitchcock forces viewers to pay attention to the behavior and blocking of the actors, as well as what they are saying to one another after they commit the crime. To support this claim, I have devised the opening sequence of Rope into 13 shot stills, listed from (1a) to (1m). These shots last for approximately five minutes after the opening titles finish. Shots (1a) through (1d) establish the perception of Brandon and Philip’s partnership and homosexuality to viewers. Following that, shots (1e) through (1h) further demonstrate the homosexual nature of this established partnership. 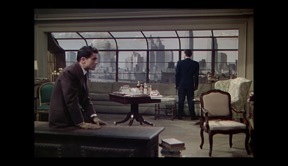 And then, with concluding shots (1i) through (1m), it will be evident that as this opening sequence progresses, Hitchcock’s suggestion of homosexuality transitions from subtle to more straightforward. This is evident in several interactions and subtext between Brandon and Philip. To begin, the first four shots, (1a) through (1d), depict the murder of David at the hands of Brandon and Philip, as well as their subsequent reactions. 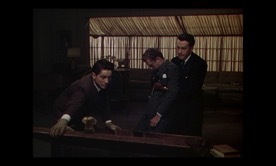 The camera pulls back from the close-up shot of David, (1a), to reveal the strangler (Philip on the left) and his accomplice (Brandon on the right). The following shot, (1b), shows Brandon checking David’s chest for a heartbeat and Philip gazing at him with a facial reaction of shock and disbelief. In shots (1c) and (1d), Brandon commands Philip to open the trunk, they place David’s body within. For a few moments after, they share silence and heavy breathing. These four shots indicate a few different things for viewers to interpret. For instance, as seen in shots (1a) through (1d), Brandon and Philip are engaging in a type of partnership with one another. 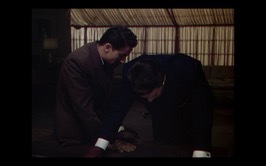 Although this bond to each other is through murdering David, it nonetheless connects Brandon and Philip together in the eyes of the audience. Secondly, shots (1b) and (1c) establish the hierarchy of their partnership. Philip’s fearful gaze at Brandon (1b), coupled with Brandon’s command for Philip to open the trunk (1c) indicate that Brandon is the dominating force behind their perceived partnership. Also, shot (1d) depicts them heavily breathing, sharing exhaustion particularly close to one another, a suggestion of a deeper connection between them both. This indication of homosexuality is subtle, yet oddly significant upon close analysis. Moreover, the portrayal of Brandon and Philip’s partnership continues in the next four shots, (1e) through (1h). The camera holds a medium shot in (1e). Brandon turns on the light, while a fearful Philip promptly rejects. In shot (1f), Brandon lights a cigarette and tries to console Philip. 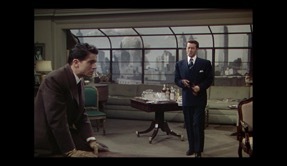 This is followed by shot (1g), where Hitchcock pulls the camera back into a long shot to show Brandon walk over to the window to open the curtains. He then stares at the view, standing with tremendous pride in shot (1h). Looking closer within these particular frames, Brandon and Philip demonstrate several quirks to their partnership, as well as a bond that extends beyond mere partners in crime. Not only is Philip’s rejection of turning on the light in shot (1e) not typical criminal behavior, but it can also be viewed as Philip keeping his emotions toward Brandon hidden in the dark. This is especially evident after he asks Brandon if they “can stay this way for a minute”. 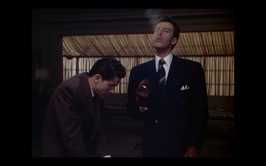 Similarly, Brandon lights a cigarette in shot (1f). His face is flooded with euphoria and relief, an indication of their earlier exchange. Additionally, in the duration of shot (1g), Brandon attempts to console Philip by opening the curtains to make him feel safer. He continues by standing and letting out a joyful sigh while gazing at the view in shot (1h). This perhaps, is a suggestion of Brandon’s pride for what he has done (murder) and also for his partnership with Philip (homosexuality). Consequently, the last five shots within this portion opening sequence, (1i) through (1m), contain the heaviest suggestions of a homosexual relationship between Brandon and Philip, especially in the dialogue. As displayed in shot (1i), Brandon walks over to Philip and admits that he wishes they could have murdered David in the daylight. This transitions to shot (1j) where the camera has moved forward into a medium shot of Brandon taking Philip’s gloves off for him. Between shots (1k) and (1l) the camera stays at a medium long shot while Brandon talks about David’s death and Philip remains uneasy, staring at the trunk, fussing that it’s unlocked. Finally, during the last shot (1m), Philip intimately confides to Brandon in a medium close-up. Straightaway, throughout shots (1i) and (1j) Brandon’s dialogue refers to the act of murdering David as “do it”. For example, during shot (1i) he says, “it’s a pity we couldn’t do it with the curtains open in the bright sunlight” and then later claims “we did do it in the sunlight”. I believe this exchange contains not-so-subtle subtext. During this time period, they would have to hide their homosexual relations from society. Hence, keeping the curtains closed, hiding their true selves from the world. Also, during shot (1j) Brandon takes Philip’s gloves off for him, which can be considered an intimate gesture. Then, shots (1k) and (1l) further depict Brandon as the stronger willed of the two. In shot (1k) the camera keeps Philip in a medium long shot as he barely takes his eyes off the trunk containing David’s body. This leads into Philip checking the lock, and Brandon commending the dangerousness of their situation in shot (1l). This whole exchange can also be taken for subtext, especially when looking at it as if Philip is afraid that their secret relationship needs to stay locked in the trunk. Subsequently, ending shot (1m) makes this claim of homosexual subtext even more substantial. This is because Philip admits to Brandon he has charm, although it frightens him. Philip then exhales deeply and glances at Brandon’s lips for a moment. This straightforward exchange is a direct implication of Philip’s intense feelings for Brandon, and of their relationship as a whole. 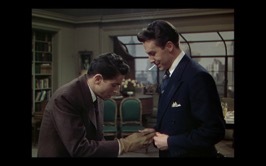 Overall, within the five-minute opening sequence of Rope, Hitchcock is able to portray a homosexual relationship between Brandon and Philip to viewers without explicitly saying so. From 13 shot stills of the sequence, I was able to demonstrate how Hitchcock managed to suggest such a taboo depiction on-screen, at least for the time period in which it was made. In shots (1a) through (1d), a homosexual partnership is established. Then, shots (1e) through (1h) convey the quirks of this partnership between the two males, as evidence that they are more than just friends. 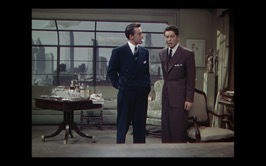 And finally, shots (1i) through (1m) exemplify Hitchcock’s profound use of subtext and intimate blocking of the actors to confirm the homosexual nature of Brandon and Philip’s relationship. 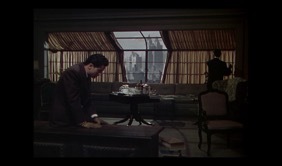 Because all of these shots and observations were from one continuous take, the evidence is reliant on the mise-en-scene and where Hitchcock has chosen us to look within the frame. 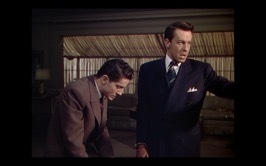 Therefore, upon close analysis, Hitchcock’s several implications of Brandon and Philip’s homosexual relationship in the film Rope should be considered profound and substantial. Laurents, Arthur. Rope. Video. Directed by Alfred Hitchcock. 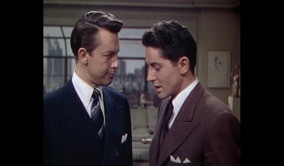 Performances by John Dall and Farley Granger. 1948. Los Angeles, Warner Bros, digital format.